Trying to source locally grown, organic food is something that's important to our family, although our reasoning on this issue might be different than some. For us, eating local is about "knowing your food" --- something that is nearly impossible if you don't know who grew it. One of our calves. 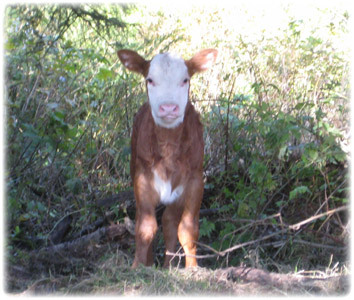 All our calves are born and raised on our farm. Getting to know your farmer is the only way to be certain of what you're buying. I recently read that Frito-Lay (PepsiCo) is being taken-to-task by shareholder activists who claim that its products are labeled as "natural" even though they are made from genetically-modified ingredients (which they didn't disclose on the labeling). The word "natural" means nothing, of course, which is why so many food producers use the term. Many farmers claim their produce is "natural" --- but the word has nothing to back it up. Do they use Round-Up? Do they use pesticides? Do they feed their livestock non-organic food? Is any of their livestock confined? The answer to all these questions can be "Yes!" and yet they can still call it "natural". Some years ago our family bought local blueberries from a non-organic family farm that claimed "no sprays". Later I drove by and saw them spraying. "What's up?" They probably didn't think Round-Up was an issue (it's natural, right?). We no longer buy berries from them, and it taught me the importance of "knowing your farmer". That's why we insist on organic certification. But certification is only a start --- in and of itself, it's not enough. Problem: most organic eggs you buy in the store come from chickens raised inside a dimly-lit, factory-style barn. The floor is made of plastic slats (to allow the manure to drop easily). Technically the chickens can go outside into an enclosed area, but it's totally devoid of plants or bugs. It's not what you would imagine when you think "organic" and if you could see the chickens you'd know they're not happy. Solution: keep buying organic eggs, but buy them from local farmers who keep the chickens in mobile coops that can be moved around on pasture (example here). Problem: the organic beef you buy in the grocery store is likely finished on grain in a feedlot-style operation that is technically organic (the cows are fed organic grain, after all) yet falls far short of what you'd expect or hope for as an organic food buyer. Solution: keep buying organic beef, but only from farmers who affirm that the beef is 100% life-time grass-only (all beef cows eat grass at some point in their lives, which is why some stores label their beef as "grass-fed" --- even though the animals are supplemented liberally with grain for the last few months of their lives). Problem: the organic pork you find in the store has likely come from barn-raised pigs who've never seen a pasture or forest in their lives. They've never been allowed to root with their noses, make dug-out nests, or loaf in the sunshine --- all necessary things for a pig's happiness and health. Solution: keep buying organic pork, but only if you know the pigs have been raised outside, on the soil. By insisting on local, organic food from farmers you've met, you'll get to know your food. Ask questions, and only accept specific answers, not vague ones. We are so grateful for the wonderful customers we have. Many of them ask plenty of questions, and that's really encouraging to us, because we are hoping that if enough people demand real, nutritious food, then perhaps we can stop the tidal wave of Transgenic "Round-Up Ready" nutrient-deficient factory-farmed "foods" that are poisoning families, killing the soil, and destroying communities. The timing on this is critical. World food production is concentrated in the hands of a small group of very large businesses, none of which you can trust. These multinational agribusinesses have a pipeline of transgenic "foods" that are being rolled out globally. The civil governments of the world have generally made things worse by passing legislation protecting the cartels. If we want healthy food, healthy families, and healthy communities, we need to say so with our pocketbooks. If we stop buying "food" from the cartels, and instead buy real food from local, organic farmers, we'll be rebuilding the foundations for our health, our communities, and the precious generations still to come.